5a: Knee hit, decent poke, hits mid. 5b: Two sword slashes, decent anti-air. Moves Archer foward. Hits mid. 5c: Two vertical slashes at the same time, groundslams aerial opponents. Hits mid. 2a: Low poke, better than 5a at poking. Hits low. 2b: Two low slashes. Hits low. 2c: Two slashes, launcher. Moves Archer forward. Hits mid. j.a: Archer sticks his foot out, hits high. Similar to the Overedge pose in episode 14. Great for crossups. j.b: Somewhat upwards slash, hits high. Probably his best air to air. j.c: Fastfall while slashing with both swords, hits high. Decent pressure move. 6b: Stabs forward with both swords, moves Archer forward. Archer's best move to close distance into a confirm. 5b: Shoots an arrow 45° downwards. 5c: Shoots an arrow horizontally. Kara cancels into any special or super. 2b: Shoots an arrow close to the ground, hits low. 2c: Shoots an arrow 45° upwards, launcher. Can TK cancel into itself when in activation. j.a: Shoots an arrow directly downwards, hits high. j.b: Shoots an arrow at a 45° angle downwards, hits high. j.c: Shoots an arrow horizontally, hits high. You cannot throw or RC in Bow Mode. 22c: Switches between sword and bow mode. Can be used in the air. Can't be used in UBW. 236a/b/c: Archer tosses his swords. Press A to call the swords back. a version = Archer throws one sword forwards and the other at a 45° angle. b version = Archer throws one sword forwards and the other at a 45° angle. c version = Archer throws both swords at a 45° angle. 623a/b/c: Archer slashes with one sword. a version = Sideways slash. b version = Upwards slash; launcher, jump cancelable. c version = Forward slash; overhead, costs meter to use. 214a/b/c: Archer jumps and spins his swords around, button controls distance. a version = Midscreen range. c version = Archer jumps nearly 3/4ths of the screen and does a 623b launching attack; jump cancelable. 236a/b/c: Archer shoots arrows forwards. a version = A quick barrage of 3 arrows. b version = A more damaging shot of 5 arrows, has longer startup. c version = Shoots a single arrow that does knockdown. Has the same startup as the b version. 214a/b/c: Archer shoots arrows upwards. a version = Two arrows land directly in front of archer. b version = Two arrows land midscreen. c version = Two arrows land at fullscreen range. j.236a/b/c: Archer shoots arrows downwards at a roughly 30° angle. a version = Archer jumps up a bit before shooting 3 arrows. b version = Archer jumps up higher and shoots 5 arrows rapidly. c version = Like a version, but it shoots a single arrow that does knockdown. 236236a: Kansho & Bakuya Overedge. If the opponent blocks the first attack, he is hit for 2200 damage. Otherwise, it hits for 600 damage. 236236b: UBW chant, consumes 60% mana. Acts as an RC. When used, the mana gauge turns red, and you have to wait until it changes back to yellow to use it again. (during UBW) 236236c: Archer shoots swords from above him at a downwards angle. If they hit, he follows-up with more swords. Acts as his grail super. 4000 damage. 236236a: Archer shoots an arrow from Hrunting forwards, it homes in on the opponent 3 times or until it hits. 1500 damage. j.236236a: Archer shoots Caladbolg downwards at a 45° angle. 2200 damage. With all UBW chants completed, activate to use Unlimited Blade Works. During UBW, press 22c to call down swords. Archer cannot use bow mode in UBW. 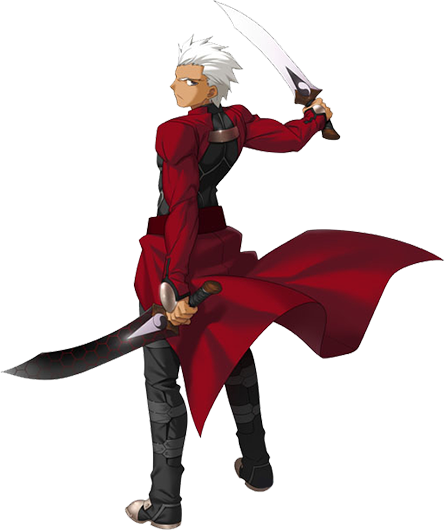 Archer has no grail super, UBW is his replacement. You can finish this off with either a basic air sword combo, or a Caladbolg from a 228C cancel. Can be extended with more stance cancel loops, with RCs, with more j.bs and j.cs, with more 82Cs, or an additional j.236A. It is possible to skip the j.b and j.c portion of the combo from the first bow mode 2c straight into the 28c loop. Easy Caladbolg descale if you're having difficulty 228c canceling. You can activate after the first j236a if you're having issues or something. Does full health damage. You can work the UBW finisher into earlier parts if necessary.